EnterTRAINment Junction – Great fun for train lovers of all ages! “All aboard”…….next stop EnterTRAINment Junction. 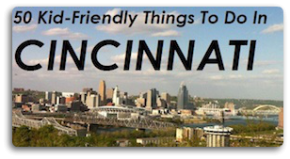 Our family enjoys visiting the wonderful family friendly activities we have in Greater Cincinnati, and we try our best to experience as much as we can but I have no idea why it took us so long to visit EnterTRAINment Junction in West Chester. It’s only a ten minute drive from our house in neighboring Butler County and I think I had some preconceived notion that we’d just see a bunch of trains and my kiddos would be entertained for thirty minutes or so then they’d want to leave. Thus, I was hesitant to pay an admission fee for all four of us to go. Lucky for us, we were able to get more than half off admission when Groupon had an awesome one day deal going (we ended up paying $30 for four combo tickets which included Funhouse Junction and two outdoor train rides which normally would have been $67.80). I’m so glad I was WRONG! Since it was a steamer (pun intended), we opted to find an air-conditioned venue for some family fun, and with myGroupon in hand, we headed to EnterTRAINment Junction. Parking is free and the 25,000 sq. ft. building is a train lover’s dream. I loved entering the main depot, giving you the feel that you’re in the heart of a small town square complete with lanterns and trees lining the cobblestone walk. My oldest said, “Mommy this is so cool”. There’s an affordable snack bar, Junction Café, on site with plenty of seating in the patio area. There are enclosed party rooms if you decide you’d like to have a birthday party (they have some fun birthday party packages available). The West Chester Station Gift Shop looks like a train depot from the outside and when you purchase your tickets it makes you feel like you’re at a train ticket window getting ready to board (bonus that the ticket agents were super friendly). The designers really thought it out and there are so many authentic details to see. Before entering the main train displays, you can also visit Junction Hobbies which is filled with trains, trains and more trains for sale plus lots of miniature display items and doll houses – perfect for any train hobbyist from young to old. Since we had our special Groupon tickets, we were able to visit all the attractions. First we started our “EnterTRAINment Journey” and entered the “world’s largest indoor, interactive model train displays with 90 large-scale trains (1,200 cars), two-miles of track, detailed cities, towns, villages, factories and much more”. Wowza! I was impressed. The train displays are so intricate – you come across so many great scenes (a family enjoying a picnic, dressage horses practicing, factory workers off to work, old towns with cable cars, tall buildings, tiny people, a subway system, a steamboat on the river, amusement park rides, park settings, streams, waterfalls and so much more). My Tasmanian devils girls aren’t much for taking it slow, so our initial pass through was a bit of a blur (luckily, we went through the exhibit a few more times after their initial excitement waned). Pick up a scavenger hunt sheet to see if you can find the items listed and be on the lookout for the eight dinosaurs hidden in the displays (as you can imagine we didn’t fare too well on this task). We had to put our train viewing on hold when the girls spotted Imagination Junction which is a train filled fun fest complete with a huge indoor play structure perfect for climbing, jumping, sliding and more. Little ones (3 and under) even have a small play area devoted to them. There’s a large scale Thomas the Train engine where they can shovel coal and use their imaginations. Bring some quarters since they’ll want to ride the indoor adorable mini train ride ($1). Even though it was hot, K wanted to ride the outdoor Kid’s Express hand-cranked railroad cars. The kiddos furiously work their arms to get their cars moving on the outdoor track (it’s only open seasonally and at designated ride times from Memorial Day through Labor Day and it’s an extra charge). After play time, we continued on our train journey and went through even more great exhibits. Older kids and adults will enjoy the American Railroading Museum that has lots of great train trivia and artifacts as well as an ongoing movie area featuring lots of great trains in motion (this would be a dream for my Dad). You can make a pit stop and let the kids hop aboard the small scale electric locomotive that takes them on an outdoor ride covering over 1000 feet of track (extra charge and open seasonally). Then make sure you head upstairs to the overlook area to get an aerial view of the indoor train display. It’s really something to see. While up there, we enjoyed a mini circus display. Once again, the amount of detail was amazing. Beyond the main EnterTRAINment Journey, they also have seasonal attractions (extra charge). We all had a great time traveling through Funhouse Junction ($6/individual admission or $3 with combo ticket). Here there is a room of trick fun-house mirrors so you never know which way to turn and then we all my husband had to get the courage up to go through the spinning black hole. The walk way is stationary but the tunnel rotates giving you the illusion that you are moving (if you are prone to dizziness don’t go in). It definitely reminds you of what an old world fun house would have been like. Going through the maze also kept my girls entertained for quite a bit. Funhouse Junction is open through Labor Day and then they convert it to Jack o’Lantern Junction ($8/individual admission or $4 with combo ticket) in mid-September through Halloween. Then another transformation occurs before Thanksgiving and your family gets to be a part of the Christmas Journey ($10/individual admission or $5 with combo ticket). My seven year old spotted another great exhibit and we visited the Expo Center where some true railroad enthusiast were on hand putting together even more exhibits and demonstrating how some of them work. There was a McDonald’s that had the cars pull up to the drive through and a little voice took their orders. Another area had a 50’s style diner and a car-hop with servers on roller skates. It was adorable. The train volunteers were so proud and friendly and made you feel very welcome. During the holiday season, this is converted to a train winter wonderland. Volunteers logged in over 50,000 man hours to make the main train displays come to life and they continue to devote their time and creativity to continually improve the current displays as well as adding new ones. Thank you Cincinnati Garden Railway Society for all your help (they even offer free clinics at EnterTRAINment Junction on the first Saturday of the month at 10:30am – sign up for Sept. 24 or Oct. 2)! We’ll definitely return to EnterTRAINment Junction and hope you’ll visit sometime soon. This would make a great gift for any train lovers you know (just thought of the perfect gift for my Dad’s birthday, shush don’t tell him please). They have 4 day multi passes you can purchase that allow you to visit EnterTRAINment Journey and the seasonal attractions any four days during the year and they also have their 1st Class Boarding passes that enable you or your family to return as many times as you’d like and enjoy all that EnterTRAINment Junction has to offer. Regular admission is $12.95/adult, $11.50/seniors 65+, $9.95/kids 3 to 12 and free/under 3. Before visiting, check their website for special offers. For more from Kristin, visit her on her personal blog, MasonMetu. Good publish! I’m browsing for this info for extended time and i have identified it here. I’m a lucky man and honestly It’ truly crucial to me. Thanks for kindly expressing it with us. This has been on our “to-do” list forever….. I so need to get up there.